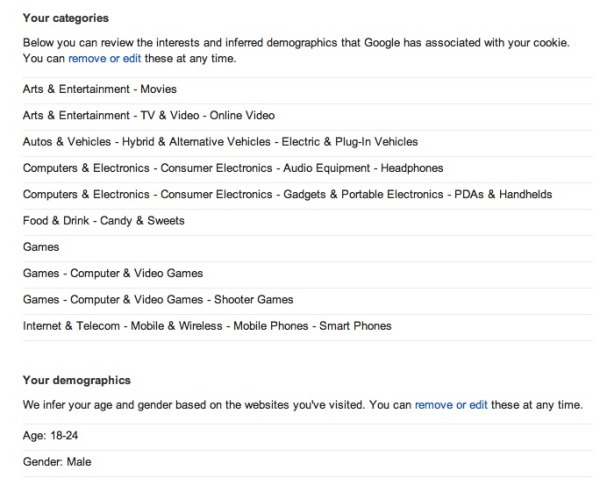 With this, you can see what information on interests Google has collected, based on the sites you've visited, and the general audience sector that the search engine has placed you in based upon it. The data is then collated, combined with other pieces of information like your location, and forms what ads you see alongside your searches, Gmail inbox plus the various other places where they appear. But the question came to us: just how accurately can Google predict who you are? Or, moreover, how true-to-form do you fit your stereotyped audience/gender/age? As you can see below, it got me right; but one of our female colleague of was thought to be a middle-aged man...explains a lot really.